Contact lenses for astigmatism: You could always correct astigmatism with glasses. Treating astigmatism with contact lenses is new, and somewhat tricky. Because Astigmatism is caused by a cornea that isn’t perfectly round, it’s difficult to find a good fit. As a result, a contact lens to correct astigmatism has to sit on the cornea precisely the right way. Contact lenses for astigmatism are called “toric” lenses, and are slightly football-shaped instead of round. The problem is that soft contact lenses can rotate on the eye as your eyes move. So someone that has astigmatism has to wear a lens designed to be stable. A toric lens contours to the shape of an eye with astigmatism. 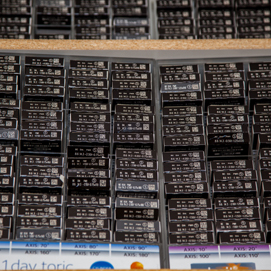 Dr. Leonard's SFV Optometry Office carries a MASSIVE variety of prescription contact lenses. By having them in-stock, he's able to help patients see better, faster. Another astigmatism contact lens option is a hybrid lens. Hybrid lenses have a semi-rigid center and high definition optics. Because of this, they align with the cornea. Then a soft “skirt” around the lens stabilizes and reduces the discomfort of the lens resting on the eye. These lenses are rotationally symmetric to eliminate blur on blink or gaze shift. Silicon hydrogel contacts were recently approved by the FDA. They are made of a special material that allows up to ten times more oxygen to reach the surface of the eye. This means they are easier on the eyes, are less likely to cause dry eyes, and in some cases can be worn up to thirty days and nights. There is also a possible treatment called “orthokeratology.” This is where you wear a semi-rigid contact lens at night. This lens is specifically designed to reshape the cornea to compensate for the astigmatism as well as nearsighted. As a result of wearing the lenses every night, you don’t have to wear anything during the day. Nobody wants to wear uncomfortable contact lenses. Trust a local vision care expert to help. Ordering contact lenses is about convenience, fit and vision correction. The good news is Dr. Leonard’s patients can conveniently reorder their lenses. Because of his convenient location in the San Fernando Valley, pick-up is a breeze. Plus, a quality diagnosis will help ensure your contact lenses fit comfortably. Need to learn more about what astigmatism is? If you have been told you have astigmatism, or know you do, you should see a trained Optometrist. Dr. Barry Leonard, the valley’s favorite Optometrist, can evaluate any of these treatments to see if they’re right for you. Dr. Leonard is a specialist in the treatment of astigmatism. Call Dr. Leonard’s office today for an appointment at 818-891-6711, or if it’s easier for you, just use the online optometry reservation form at the top of this or any page.